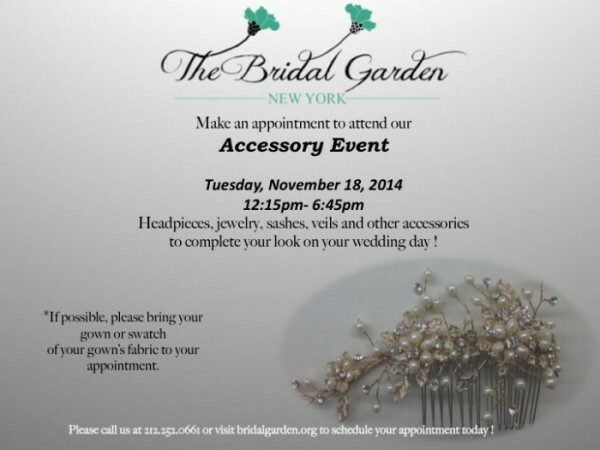 Fall Accessory Event at The Bridal Garden ! I had the most wonderful experience with The Bridal Garden! I came in not expecting to find the dress of my dreams that day, but that's exactly what I did! Gina was so wonderful and knowledgeable about all of the gowns and designers. Everyone made me feel very comfortable. I did not feel rushed or pressured at all. I loved everything about my experience and the dress that I walked out with. I feel like I found something that fits my personality more than i ever could have imagined. I would highly recommend The Bridal garden to everyone!